The agency develops and oversees transportation plans, policies, funding programs, and both short-term and long-range solutions to mobility, accessibility and environmental needs in the county. The agency is also the primary transit provider for the City of Los Angeles, providing the bulk of such services, while the City of Los Angeles Department of Transportation (LADOT) operates a much smaller system of its own: Commuter Express bus service to outlying suburbs in the city of Los Angeles and the popular DASH (Downtown Area Short Hop) mini-bus service in downtown and other neighborhoods. Metro's headquarters are in a high-rise building adjacent to Union Station in downtown Los Angeles. The Los Angeles County Metropolitan Transportation Authority operates the third-largest public transportation system in the United States by ridership with a 1,433 mi² (3,711 km²) operating area and 2,000 peak hour buses on the street any given business day. Metro also operates 105 miles (169 km) of urban rail service. The authority has 9,892 employees, making it one of the region's largest employers. 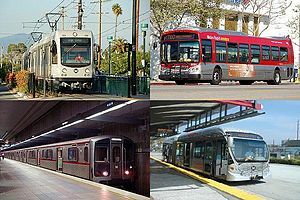 In 2006, the Los Angeles County Metropolitan Transportation Authority was named Outstanding Transportation System for 2006 by the American Public Transportation Association. Most buses and trains have "America's Best" decals affixed. Metro Rail is a rail mass transit system with two subway and four light rail lines. As of November 2016[update], the system runs a total of 105 miles (169 km), with 93 stations and over 316,000 daily weekday boardings. Starting in 2019, lines will be renamed with lettered designations, citing a lack of distinct colors available for future services. The Gold Line (opened 2003) is a light rail line running between East Los Angeles and Azusa via Downtown Los Angeles. The Expo Line (opened 2012) is a light rail line running between Downtown Los Angeles and Santa Monica. Metro operates two types of bus services which are distinguished by the color of the buses. However, when mechanical problems or availability equipment occurs, a bus of any color may be substituted to continue service on the route. Metro Rapid buses are distinguished by their bright red color which the agency has dubbed “Rapid Red”. This bus rapid transit service offers limited stops on many of the county's more heavily traveled arterial streets. Metro claims to reduce passenger commute times by up to 25% by several methods, among them a headway-based schedule so that drivers are not held up at certain stops and signal priority for Rapid buses. All Metro buses are CNG-powered, the largest such fleet in the United States. The CNG fleet reduces emissions of particulates by 90%, carbon monoxide by 80%, and greenhouse gases by 20% compared to diesel powered buses. Alternative fuel buses have logged more than 450 million operating miles since 1993, an industry record. El Monte Busway (opened in 1974) is a combination transitway and high-occupancy toll (HOT) roadway that runs in the median of the San Bernardino Freeway (I-10) and on a separate right-of-way. The transitway provides express bus service between Downtown Los Angeles and the San Gabriel Valley. Services are operated by both Metro and Foothill Transit. Harbor Transitway (opened in 1998) is a combination transitway and HOT roadway that runs in the median of the Harbor Freeway (I-110). The transitway provides express bus service between San Pedro and Downtown Los Angeles. It carries buses operated by Metro, Orange County Transportation Authority, LADOT, Gardena Municipal Bus Lines and Torrance Transit. A bikeshare program called "Metro Bike Share" which operates within Downtown Los Angeles, Venice, and the Port of Los Angeles. The system was introduced in early 2016 at a cost $16 million and uses about 1,400 bikes and 93 stations. Metro briefly expanded the service to Pasadena, but they ended it in September 2018 due to low ridership. Fare evasion was estimated in 2007 to be at 6%, costing Metro $2.6 million annually. In response to this, the Metro board approved fare gating of all stations on the Red and Green Lines, and selected stations on the Orange, Blue, and Gold Lines, capturing 84% of passengers using the system. 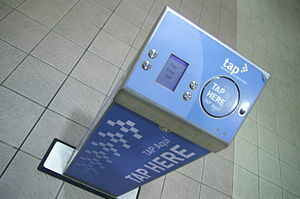 Adding fare gates was selected to increase fare collections, implement distance based fares on rail and transitways in the future, and reduce the potential of the system to terrorist attack. Former Metrolink executive director Richard Stanger critiqued the gate installation by citing its cost and ineffectiveness, concerns ultimately dismissed by the Metro board. Service councils were created as governance councils in 2001, in response to complaints about the effectiveness of Metro service in suburban areas. Communications between sectors and riders was poor, according to a report by the California State Auditor which was released one year into the new structure. In addition, each sector had its own scheduling, operations, and maintenance divisions, causing effort duplication, organizational silos, and inefficiency. Thus, in 2009, the sectors were eliminated, and transportation, maintenance, service planning, and administration were recentralized under the guidance of Metro's Chief Operations Officer. Governance councils, renamed service councils, now have more responsibility over local issues such as stop placement and service changes, while larger issues are handled by the Metro board. To increase sustainability in transportation services, Metro also provides bike and pedestrian improvements for the over 10.1 million residents of Los Angeles county. These focuses have gleaned positive outcomes – in 2015, Metro displaced more greenhouse gas emissions (CO2) than it produced by 7,093 metric tons. Metro also released a study detailing the empirically founded impact of their green initiatives. Metro has expanded its Metro Rapid bus system with a goal of 28 lines since 2008. A Special Master ruling in December 2005 requires Metro to increase service on all Rapid bus routes to every 10 minutes during the peak period and every 20 minutes during the mid-day and evening. Service would be required to operate between 5 a.m. and 9 a.m. on all Rapid routes. Metro has chosen not to appeal the ruling and began implementation on all Rapid routes in June 2006. In addition, the agency is embarking on a massive bus restructuring effort entitled Metro Connections. The project is designed to convert the current grid-based bus system, implemented in 1980, to a hub and spoke system focused on activity centers. The system is to be phased in the next four years, and will include new express routes and reconfigured local service. Suburban service and low ridership shuttles will be considered for operation by municipal agencies, restructuring, or cancellation. In 2015, Metro studied renaming its rail and bus rapid transit lines using a letter-based scheme. Phase 1 of the Purple Line Extension will add three new subway stations at Wilshire/La Brea, Wilshire/Fairfax, and Wilshire/La Cienega. Further phases will extend the line to Century City and Westwood. Construction of the second section will start in 2018. The West Santa Ana Branch via Stanton and Garden Grove to Santa Ana is an additional corridor identified for possible future expansion of rail or busway service. The current proposal is a light rail line with a new route from Union Station to the Green Line, then the West Santa Ana Branch right-of-way to Artesia. The Orange County Transportation Authority (OCTA) is collaborating with the cities of Santa Ana and Garden Grove on the OC Streetcar on the southerly portion of the West Santa Ana Branch. Measure M, passed on November 2016, extends and increases the Measure R 30-year half-cent sales tax to a permanent one-cent sales tax. This tax is expected to fund $120 billion in highway and transit projects over 40 years. The tax is also expected to support over 778,000 jobs in the Los Angeles area and $79.3 billion in economic output. The Metro rail and bus fleet often make appearances in films and television shows produced in the Los Angeles area, including 2012, Crash, Volcano, Superbad, Collateral, The 40-Year-Old Virgin, Battle: Los Angeles, and Captain Marvel. One of the earliest appearances was in the 1994 movie Speed with Keanu Reaves and Sandra Bullock, in which the Metro plays a key part in the plot. ^ "Help & Contacts." Los Angeles County Metropolitan Transportation Authority. Retrieved on March 18, 2010.